PrimacareRX | Is There Mercury in Your Baby’s Food? 03 Nov Is There Mercury in Your Baby’s Food? A new study published in the Journal of Agricultural and Food Chemistry evaluated the levels of methylmercury in a variety of rice based infant cereals. Researchers tested a variety of rice-based cereals from the United States and China and found the rice cereals from the two continents had similar mercury levels.2 The mean concentration of the samples that were tested was 2.28 micrograms of methylmercury per kilogram of product.2 Based on the mean concentration found by the researchers, it is estimated that infants who consume rice cereal products could ingest between 0.004 to 0.123 micrograms of methylmercury per kilogram of body weight daily.2 The U.S. Environmental Protection Agency (EPA) has set a 0.1 microgram/kg/day reference daily dose for methylmercury.2 This reference daily dose is based on factors that may not be applicable to infant rice cereal, and the effects of this amount of mercury are not yet fully known. More research is needed to determine if rice based cereal could potentially harm your baby. In the meantime, stick to other grain cereals just to be safe! As you begin to start your baby on solid food, it is important to still consider taking a post-pregnancy prenatal vitamin for nutritional support for you. If you are planning on becoming pregnant again soon, it is especially important to maintain adequate plasma levels of essential vitamins, like folate, to aid in proper neural tube closure shortly after conception. PrimaCare™ delivers key nutrients to help support your post and pre-pregnancy needs. PrimaCare™ contains bioavailable folate, Omega-3s, biotin, and iron, all to support your pregnancy journey. References: 1. Mayo Clinic Staff. Healthy Lifestyle: Infant and toddler health. 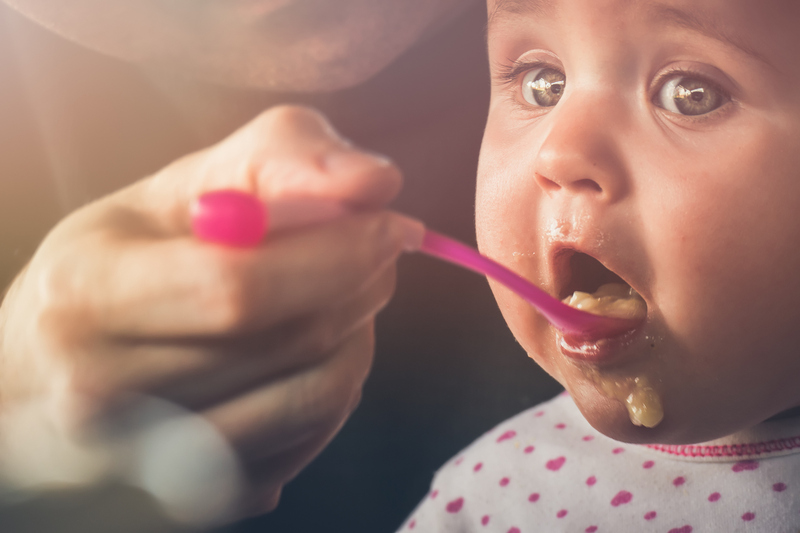 Solid foods: How to get your baby started. Website. https://www.mayoclinic.org/healthy-lifestyle/infant-and-toddler-health/in- depth/healthy-baby/art-20046200?pg=1. Published April 14, 2017. Reviewed October 30, 2017. 2. American Chemical Society. “Some infant rice cereals contain elevated levels of methylmercury.” ScienceDaily. ScienceDaily, 25 October 2017. www.sciencedaily.com/releases/2017/10/171025090458.htm. 3. American Pregnancy Association. Foods to Avoid During Pregnancy. Website. http://americanpregnancy.org/pregnancy-health/foods-to-avoid-during-pregnancy/. Updated July 20, 2017. Reviewed October 30, 2017. 4. Wenbin Cui, Guangliang Liu, Meara Bezerra, Danielle A. Lagos, Yanbin Li, Yong Cai. Occurrence of Methylmercury in Rice-Based Infant Cereals and Estimation of Daily Dietary Intake of Methylmercury for Infants. Journal of Agricultural and Food Chemistry, 2017; DOI: 10.1021/acs.jafc.7b03236.